American Cameo Press "Banana Castings" are manufactured from the highest quality aluminum and made to last as long as possible. The Banana castings are machined at our factory, to be a direct replacement. 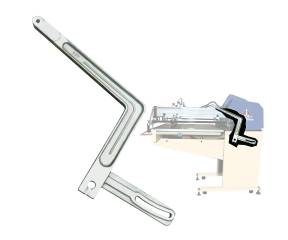 Cameo presses have ben manufactured by American Screen Printing equipment company for over 30 years. Make sure you choose the correct one for the Cameo press you have. Check by measuring the vacuum table. The Cameo 18 is 12" x 18"(30.48 x 45.72cm), the Cameo 24 is 14" x 24"(35.56 x 60.96cm), the Cameo 30 is 22" x 30"(55.88 x 76.20cm) and the Cameo 38 is 25" x x38"(63.50 x 96.52cm). Buy a spare "Banana Casting". This is a replacement part.